I`m giving up Bridge, tonight`s my last night. It's amen to Stayman, I give up the fight. The insults and muddles are giving me troubles. I can`t sleep at night for thinking of doubles. Who`s played, and what's trumps, and what's gone on my right! So for now it`s all over, I`m off to the backwoods. I`m bidding good-bye to Gerber and Blackwood. I can`t stand the hassle, I can`t stand the pain. I`m getting those bad cards again and again. So I`m giving up Bridge, tonight`s a bad night. Declarer is horrid and nothing`s gone right. My partner's a dope and I`m losing all hope. And when s/he says "double," I know we`re in trouble. S/he kept right on bidding, clear up to the sky. When to my surprise, the high bidding pays! And I have to admit, my partner`s a brick. 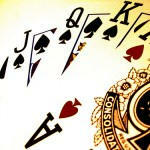 Contract bridge, or simply bridge, is a trick-taking game using a standard deck of 52 playing cards. It is played by four players in two competing partnerships, with partners sitting opposite each other around a table. 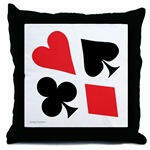 Millions of people play bridge worldwide in clubs, tournaments, online and with friends at home, making it one of the world's most popular card games. For purposes of scoring and reference, each player is identified by one of the points of the compass and thus North and South play against East and West. The game consists of several deals each progressing through four phases: dealing the cards, the auction (also referred to as bidding), playing the hand, and scoring the results. Dealing the cards and scoring the results are procedural activities while the auction and playing the hand are the two actively competitive phases of the game.